All day long the media here in the U.S. bashes Trump while making a point of ignoring Hillary Clinton’s negatives. Regular readers of Balladeer’s Blog are aware of my antipathy toward both main political parties here in the U.S. (DemCorp and RepubCorp) but media bias is SO severe this election year that it’s refreshing to find someone making a case for a candidate based on something other than “mean” remarks or the usual shallow things the media obsesses over. “President Obama and Secretary of State/Presidential Candidate Clinton have the lawyer’s ability to give good speeches (though not consistently). A close examination, however, reveals the mess Mrs. Clinton left at the State Department and the news is full of the multiple disasters she has left in her wake since her first job on the Watergate Committee in the 1970s. “The litany of national crises precipitated by President Obama fills books and continues to make news headlines. His legacy is a nation worse off than it was 8 years ago by almost every measure. “So, in 2016, I’m voting for common sense. “I am voting to end the ridiculous ways politically-correct language is changing the way we live, disrupting our universities and making people afraid to speak out about deeply held personal views. I’m tired of ‘safe places’ and ‘trigger warnings’ and all the silliness that political correctness has imposed on US citizens. “I’m voting for lawful immigration with secure borders and a legal process for becoming an American citizen with its rights, privileges and responsibilities. We should not admit more immigrants to the country than can be absorbed by the infrastructure; we should not allow immigrants who have no intention of assimilating into American culture and becoming American. “I’m voting for a return to considering America’s best interest in international decisions. Yes, the world is increasingly a small place when anyone can fly to its farthest reaches in just a few hours, but it’s time our president respected America and Americans and paid attention to what’s beneficial for our citizens. 34. 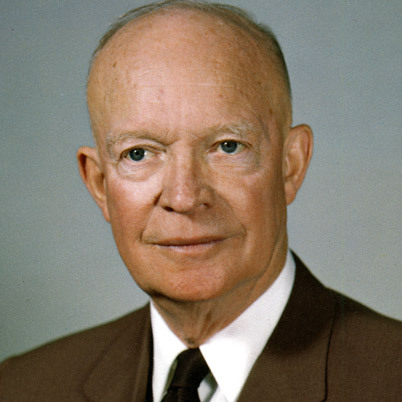 DWIGHT EISENHOWER – Motto: “FOOORE!” (Remember, the traditional cry as you’re teeing off in golf? Oh, never mind!) *** Nickname: Uncle Milty *** Pro: Knew enough to distrust Richard Nixon long before it became the national pasttime. Con: Was the first president to pronounce nuclear as “nucular”. 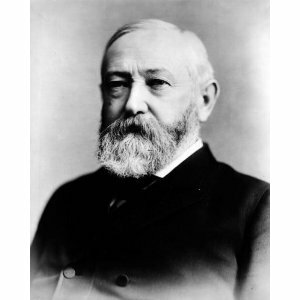 BENJAMIN HARRISON – Motto: “What this country needs right now is a man whose grandfather was president barely a month before dying.” *** Nickname: Baby McKee’s Grandfather *** Pro: Was the president who first had the White House wired for electricity. Con: His administration was slightly overshadowed by the press’ obsession with his terminally “cutesy” grandson, Baby McKee.